Clad steel buffer rods consisting of a core and a cladding are developed for ultrasonic monitoring of several industrial material processes. The core of these rods is made of low ultrasonic loss steels, and the stainless steel cladding, fabricated by thermal spray techniques ensures proper ultrasonic guidance. These rods ranging from tens of centimeters to 1 m long can function under temperature up to 960°C. The clad buffer rods can also be machined into the desired shapes such as those of commercial temperature and pressure sensors. On-line ultrasonic monitoring in polymer extrusion at 200°C and thickness measurement of metals including liquid metals at temperatures up to 960°C are presented to demonstrate the capabilities of these rods. The trend in global trading demands high quality products manufactured by efficient, mass production and cost-effective technologies. Ultrasound, due to its capability to probe the interior of the materials, is an attractive approach. Recently, the needs of on-line or in-situ monitoring for several industrial materials processes were demonstrated [1-17]. Ultrasonic pulse-echo techniques which are simple and economical have been used to characterize the properties of solids and liquids, including molten polymers and metals at elevated temperatures. Because it is not convenient to obtain high temperature piezoelectric ultrasonic transducers (UTs), one classic approach using buffer rods is still attractive and adopted here due to its simplicity and low cost [1-17]. The UT end of the buffer rod developed here is air cooled so that the high performance room temperature UTs can be used and the other (probing) end contacts the processed part. Clad buffer rods, composed of a central core and an outer cladding, have been shown to provide a good signal-to-noise ratio (SNR) when used in ultrasonic pulse-echo instruments [8,9]. They can be made of different materials and fabricated by different techniques. In this presentation, clad steel buffer rods are used to monitor the polymer extrusion and to perform the thickness measurement of metals at very high temperatures. Longitudinal wave UTs of 5 MHz are used. Clad steel buffer rods consist of a steel core, a stainless steel inner cladding and a bronze outer cladding. The stainless steel (SS) inner cladding is to ensure the proper ultrasonic guidance in the core and the bronze outer cladding is solely for the machining and cooling purposes [8,9]. The steel and SS cladding are chosen because they are economical and have high mechanical strength and melting temperature. Depending on the desired application, the length and the diameter of the clad buffer rods are chosen. At present, the length and diameter can be fabricated up to 2 m and 50 mm at IMI. Below only two different sizes of clad steel buffer rods are presented for demonstration purposes. Figure 1 shows a clad steel rod which has a length of 131 mm and a probe end diameter of 7.8 mm. This length is long enough such that the air cooling would not affect the temperature at the probing end of the clad rod. It is also short enough to have a small propagation loss and size. The air cooling pipes are installed around the threading region which is machined near the UT end of the clad rod. The size and shape of the clad buffer rod is given in Fig.1. The cooling keeps the temperature at the UT end below 50°C. The diameter of the UTs is 6.35 mm. 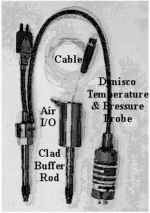 Figure 1 also demonstrates that this clad rod can have the same end shape as those of the Dynisco temperature & pressure probes. Because of this unique attraction, one could interchange these three types of sensors depending on the desired monitoring purposes. Figure 2 displays the reflected longitudinal wave echo at 5 MHz, with excellent signal-to-noise ratio (SNR), from the probing end of the rods as shown in Fig.1 where L1 and L2 are the 1st and 2nd echoes, respectively. It is noted that the clad buffer rods also have superior performance in shear wave pulse echo measurements . Fig 1: A clad steel buffer rod together with a temperature & pressure probe from Dynisco Fig 2: Reflected longitudinal wave signals at 5 MHz from the clad buffer rod end shown in Fig.1. A clad steel rod which has a length of 1 m and a probing end diameter of 15 mm is shown in Fig.3. This long length is chosen for probing the liquid metals in very large size containers such as liquid aluminum in electrolyte cells. The particular shape has been manufactured such that high SNR ultrasonic echoes can be obtained. In fact, longitudinal wave echoes at 5 MHz reflected from the end of the 1 m long buffer rod has a 50 dB SNR as shown in Fig.4. The diameter of the UT was 12.7 mm. Shear wave can be also guided in such rods with very high SNR. Fig 3: A one meter long clad steel buffer rod. Fig 4: Reflected longitudinal wave signals at 5 MHz from the clad buffer rod end shown in Fig.3. Fig 5: Clad rods installed in a die of a co-extrusion blow molding machine from PLACO. The optimization of a multilayer blow molded part is closely related to the parison shape and dimensions (diameter and thickness), which in turn are dependent on the material properties such as the viscosity and uniformity of the melts and the location of the interface between the layers inside the co-extrusion die during the extrusion stage. In order to optimize this process, ultrasonic monitoring techniques are investigated here. 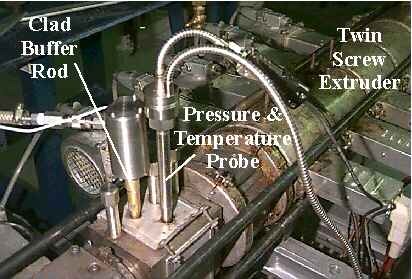 Due to high (~200°C) extrusion temperature the ultrasonic monitoring was carried out using the clad buffer rod shown in Fig.1. A co-extrusion blow molding machine from PLACO was used for the experiments. Figure 5 shows that two ultrasonic, two pressure and one temperature probes are inserted into the die at different locations. Because the shape of clad ultrasonic buffer rods is made to have the same shape as those probes from Dynisco as shown in Fig.1, these sensors can be interchangeable. The upper, middle and lower curves in Fig.6 display the typical reflected echoes during the single extrusion of 2 mm thick HDPE, single extrusion of 2 mm thick Santoprene and co-extrusion of HDPE/Santoprene (~1 mm thick for each layer), respectively. L2, L4 and L6 are the 1st, 2nd and 3rd round trip echoes inside the extruded polymer of 2 mm total thickness. In Fig.6 the longitudinal velocities, VL's of the molten HDPE and Santoprene are 1275 and 1110 m/s, respectively. It is observed that the ultrasonic attenuation is higher in Santoprene than in HDPE. Fig 6: Reflected longitudinal wave signals at 5 MHz during extrusion. The stability of the extrusion process can be determined by the absolute time delay of the echoes L2 or L4 because it is related to the material properties of the extruded polymers. Since the ultrasonic travel time in L4 is twice as that in L2, the time delay of L4 is more sensitive to the instability of the extrusion. Figures 7 and 8 show the signals obtained from a stable and an unstable extrusion run, respectively. In Figs.7 and 8, the interface echoes can be identified. The signals in these two figures have gone through the signal processing techniques including deconvolution. From the velocity and time delay information one can obtain the extrusion stability and thickness of the molten HDPE and Santoprene during co-extrusion. The quality of adhesion can be also obtained from the amplitude of the interface echo . Fig 7: Reflected longitudinal wave signals at 5 MHz in a stable extrusion run. Fig 8: Reflected longitudinal wave signals at 5 MHz in an unstable extrusion run. Fig 9: A clad rod installed in screw section of a twin screw extruder from Leistritz. 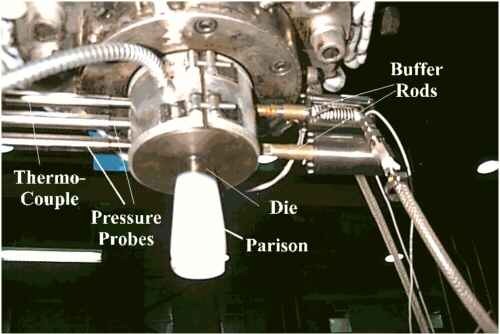 The ultrasonic monitoring of polyethylene (PE), polystyrene (PS) and their blends during twin screw extrusion was carried out using a clad buffer rod in a twin screw extruder from Leistritz as shown in Fig.9. The clad buffer rod was installed in such a way that its probing end was set flush to the barrel inner wall, as seen from Fig.10 so as not to disturb the polymer flow. Since the clad buffer rods have high performance in the reflection geometry, in principle, one may monitor the polymer properties along the screw axial directions (e.g. from feed hopper to the exit die). The monitoring results of PE under different screw rotational speeds are given in Fig.11. In order to compare the amplitude of the echoes, echoes L2 and L4, of each curve, the amplification factor is given; The smaller is the amplification factor, the larger is the amplitude. The operational temperature and pressure were kept around ~220°C and ~540 psi, respectively, but fluctuations were observed sometimes. As the screw geometry inside the barrel was similar to that illustrated in Fig.10, echoes were detected each 180 degree rotation. The maximum echo amplitude in 360 degree rotation at each angular frequency is given in Fig.11. It can be seen that the different rotational speeds will affect both the time delay and the amplitude of the ultrasonic echoes which travel in the molten polymers between the clad buffer rod probing end and the flat valley region of the screw. Fig 10: Schematic of a clad rod for ultrasonic monitoring during extrusion. Fig 11: Twin screw extrusion of polyethylene at different screw rotational speeds. Fig 12: Twin screw extrusion of polystyrene (PS) and polyethylene (PE) blends at 200 rpm screw rotational speed. Figure 12 also demonstrates the variations of the time delay and amplitude of the ultrasonic echoes L2 and L4 with respect to different concentrations of PS and PE in the resulting polymer blend. Detailed explanations of these observations can be found in [6,7,17]. The clad buffer rods presented here can be also used to perform the monitoring of the variation of composition of polymer blends, concentration/dispersion of fillers and molecular weight distribution reported in [6,7] and of foams extrusion reported in . The short clad buffer rod shown in Fig.1 has been also used to measure the thickness of an aluminum plate heated at 550°C. Figure 13 shows the schematic of the measurement setup. The liquid couplant used was a high temperature machine oil. Since the oil evaporates within a few seconds, the momentary contact (< two or three seconds) technique was applied. For this momentary contact method the air cooling is sometimes not necessary. The reflected longitudinal wave echoes at 5 MHz near the interface between the clad rod probing end and the aluminum alloy plate 50 mm thick 76.2 mm diameter at 550°C are given in Fig.14. Since the velocity of aluminum alloy can be calibrated with respect to the temperature, the ability to measure the thickness of aluminum at such a temperature is demonstrated. Fig 13: Schematic for the ultrasonic thickness measurement using momentary contact. Fig 14: Reflected longitudinal wave echoes at 5 MHz in 50 mm thick aluminum plate at 550°C. The 1m clad buffer rod shown in Fig.3 has been used to measure the thickness of the liquid aluminum at 967°C in an industrial electrolyte cell. Figure 15 shows this measurement configuration. In this case, we observed longitudinal wave echoes at 5 MHz from the end of the buffer rod and from the liquid aluminum - carbon cathode interface. In Figure 16, the four ultrasonic traces from the top to the bottom correspond to distances between the end of the buffer rod and the top surface of the cathode of 2.1, 2.6, 3.2 and 3.6 cm, respectively. The observation of such echoes means that liquid aluminum wets well the buffer rod and the thickness can be measured in an accuracy better than 0.5 mm. Such type of buffer rods was also used to measure the thickness of liquid zinc, cryolite and magnesium. Since liquid aluminum is highly corrosive towards steels, each measurement time is less than 30 minutes and then the probing end surface is remachined. This remachining also consumes about 1 mm of rod length. To reduce the corrosion concern, clad ceramic buffer rods are being developed for the measurement of long duration . Fig 15: Schematic for ultrasonic thickness measurement of liquid aluminum at 967°C. Fig 16: Ultrasonic longitudinal wave echoes at 5 MHz reflected from the liquid aluminum-carbon cathode interface. Clad steel buffer rods consisting of a steel core and a stainless cladding were developed for ultrasonic monitoring of several industrial material processes. The core of these rods is made of low ultrasonic loss steels, and the stainless steel cladding, fabricated by thermal spray techniques ensures proper ultrasonic guidance. These rods ranging from tens of centimeters to 1 m in length have very high SNR in pulse echo measurements operated in reflection mode. They can function under a temperature up to 960°C. The clad buffer rod probing end can also be machined into the desired shapes such as those of commercial temperature and pressure sensors. On-line ultrasonic monitoring in polymer co-extrusion and twin screw extrusion of polymers in the screw section at 200°C were presented. It has been shown that the thickness, bond quality, composition variation, extrusion stability, etc. during the extrusion process can be monitored. Clad buffer rods using momentary contact technique were also applied to measure the thickness of aluminum plate at 550°C. Thickness measurements of liquid aluminum at 967°C were also presented. The authors would like to thank the technical assistance of S.-S.L. Wen and T.-F. Chen of McGill university, M. Carmel, B. Harvey, F. Belval, A. Garcia-Rejon and R. Gendron of IMI. Financial support from the Natural Sciences and Engineering Research Council of Canada from an operating and a strategy (STR0192858) grant is gratefully appreciated. L.C. Lynnworth, Ultrasonic Measurements for Process Control, New York: Academic Press, 1989, Ch.7, pp.449-536. T.L. Mansfield, "Ultrasonic technology for measuring molten aluminum quality", Materials Evaluation, vol.41, pp.743-747, 1983. R.L. Parker and J.R. Manning, "Application of pulse-echo ultrasonics to locate the solid/liquid interface during solidification and melting", J. of Crystal Growth, vol.79, pp.341-353, 1986. C.A. Youngdahl and W.A. Ellingson, "Non-destructive monitoring of erosive wear in transfer lines and cyclones at synfuels pilot plants, in: Corrosion 84, Paper No.86, pp.86/1-86/12, North American Corrosion Engineers 1986. N.D.G. Mountford, S. Dawson, I.D. Sommerville and A. McLean, "Acoustic sensors for process control in the year 2000", Metallurg. Proc. for the year 2000 and Beyond, (H.Y. Sohn and E.S. Geskin eds), The Minerals, Metals and Mat. Soc., pp.745-760, 1988. L. Piché, A. Hamel, R. Gendron, M.M. Dumoulin and J. Tatibouët, "Ultrasonic characterization of polymer melts under processing conditions", US Patent 5,433,112, 1995. R. Gendron, J. Tatibouët, J. Guevremont, M.M Dumoulin, L. Piché, "Ultrasonic behavior of polymer blends", Polymer Eng. And Science, vol35, pp.79-91, 1995. J.-G. Legoux and C.-K. Jen, "Ultrasonic applications of thick metallic coatings", Proc. 9th Theram Spray Conf. (C.C. Berndt) pp.65-72, 1996. C.-K. Jen and J.-G. Legoux, "High performance clad metallic buffer rods", Proc. IEEE Ultrasonics Symp., pp.771-6, Nov. 1996. C.-K. Jen B. Cao, K.T. Nguyen, C.A. Loong and J.-G. Legoux, "On-line ultrasonic monitoring of a die casting using buffer rods", Ultrasonics, vol.35, pp.335-44, 1997. V. Shah, K. Balasubramaniam, R.-D. Costley and J.P. Singh, "Sensor development for high temperature viscosity measurement", Proc. Rev. Progress in QNDE Conf., vol.17, pp.853-857, 1997. J.-Y. Chen, S.V. Hoa, C.-K. Jen and H. Wang, "In-situ monitoring of graphite/epoxy cure using optical fiber and ultrasonic sensors", Proc. 12th Annual Technical Conf., Amer. Soc. Composites, pp. 872-881, 1997. C.-K. Jen, J.-Y. Chen, S.V. Hoa, K.T. Nguyen, J.-G. Legoux and H. Hébert, "Clad buffer rods for in-situ process monitoring", Proc. IEEE Ultrasonics Symp., pp.801-806, 1997. Y. Liu, L.C. Lynnworth, M.A. Zimmerman, Ultrasonics, "Buffer waveguides for flow measurement in hot fluids", vol.36, pp.305-315, 1998. A. Sahnoune, L. Piché, A. Hamel, R. Gendron, L.E. Daigneault and L.-M. Caron, "Ultrasonic monitoring of foaming in polymers", SPE ANTEC, pp.2259-2263, 1997. S.-S.L. Wen, T.-F. Chen, D. Ramos-França, K.T. Nguyen, C.-K. Jen, I. Ihara, A. Derdouri and A. Gacia-Rejon, "Recent progress in on-line ultrasonic process monitoring", Proc. SPIE, vol.3399, pp.122-130, 1998. D. Ramos França, C.-K. Jen, K.T. Nguyen and R. Gendron, "On-line ultrasonic monitoring of polymer extrusion", submitted to J. Polymer Engineering and Science, July. 1998. B.R. Marple, C.-K. Jen, and J. Voyer, "Ceramic-Clad Ceramic System for Ultrasonic Wave Guidance"; Proc.15th Int'l Thermal Spray Conf., Edited by C. Coddet. ASM Int'l, Materials Park, OH, pp.1109-1114, 1998.